The International Association of Gerontology and Geriatrics European Region (IAGG-ER) 8th Congress took place in the CCD from 23-26 April 2015. Conference Partners had previously worked with local conference host, Professor Desmond O’Neill of Trinity College Dublin, on bringing the 6th Congress of the EUGMS to Dublin from 29th September – 1st October 2010 so were delighted to repeat that hugely successful partnership again. The theme of the IAGG-ER 8th Congress Dublin 2015 was ‘Unlocking the Demographic Dividend’. The strength and appeal of the scientific programme brought 1,300 geriatricians, old age psychiatrists, gerontological nurses, social gerontologists, gerotechnologists, economists, scientists in the biology of ageing, policy makers and nutritionists from 65 countries around the world to Dublin to debate, network and experience our renowned Irish hospitality. 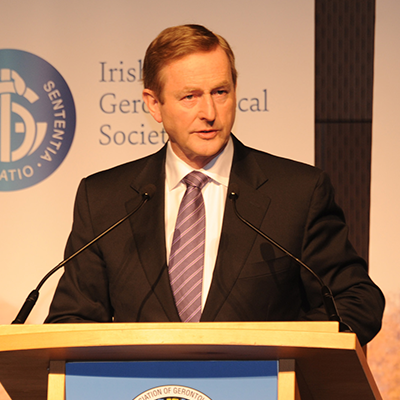 The four day conference was officially opened on Thursday, 23rd April by An Taoiseach, Enda Kenny T.D., followed by a moving performance by the CIE Male Voice Choir. The Welcome Reception took place in the exhibition area, giving delegates the opportunity to reacquaint with old friends and make new connections. Nearly 1,200 abstracts were accepted and delivered via 185 oral presentations, 99 symposia and 607 posters, rotated on a daily basis. In addition, 30 high profile international keynote speakers were invited to address topics such as geriatric syndromes, neuropsychology and successful aging throughout the duration of the conference. The complexity of the extensive programme required excellent management and communication on the part of Conference Partners to ensure a seamless, informative and relaxed meeting experience for all stakeholders. The Forum formed the hub of the conference housing 30 exhibitors and sponsors, the poster boards and all refreshment and lunch breaks. As the social aspect of any conference is always hugely important in terms of strengthening bonds between delegates and creating informal opportunities for learning and relationship building, Conference Partners designed a social programme that offered a balanced mix of Irish culture, fun and entertainment. Social events included a gala dinner at the Mansion House, the official residence of the Lord Mayor of Dublin, the option of a traditional Irish Night at Taylors Three Rock at the foot of the Dublin mountains, and an Accompanying Persons Programme that included a guided tour of Georgian Dublin taking in Trinity College and the world famous 9th century gospel manuscript, the Book of Kells.